After extreme periods of use your HVAC system needs an air duct cleaning service, and central air conditioning systems get their biggest workout during the summer months. It’s been a hot one this summer in the Pacific Northwest. Your AC has probably been on more than it’s been off for the last several months. As the Summer comes to an end and the chaos dies down and the kiddos return to school, it’s time to think about getting your home back in order. Here are five reasons why fall is the ideal time to have an air duct cleaning service. 1. Typical home cleaning takes a summer vacation, too. The great thing about the Summer, especially here in the Pacific NW, is how great it is to spend time outside with the family. Days at the park, or the river, maybe camping for a long weekend or more. Let’s face it, you’ve been busy, so maybe, just maybe, your typical house cleaning routine has taken a backseat to quality family time. Good for you, there is nothing better than getting that much needed quality time with the family, the mess at home will still be there tomorrow after all. (I know it will be at my house) As we all get back into the routine of the school year it’s a great time to schedule an air duct cleaning service. With less dust, dirt and debris in your home’s HVAC system, it will help keep things cleaner around the house as well. 2. Fall is an allergy season. Did you know that for many people who suffer from seasonal allergies, Fall can actually be the worst season of all? The heat and humidity from summer gives way to drier air in the fall. This transition in the air often causes harsh sensations in the nostrils (the dreaded “allergy nose”) and can lead to frequent sneezing. In addition to changing air conditions, as the season changes a whole new crop of pollen’s are floating around. The combination of drier air and new pollen can wreak havoc on allergy suffers! An air duct cleaning service from J&M Services can help ensure that your home can be a place of refuge for your sinuses. 3. The amount of time your going to spend indoors is about to go way up. As the warm weather fades and the cooler, and in the Great Pacific NW “wetter”, weather rolls in we’re all going to be spending a lot more time indoors. Those outdoor evening adventures with the family are going to turn into game night with the family. The gas bbq on the back deck gives way to the gas fireplace in the living room. With so much more of your family time taking place inside your home during the fall and winter months, it’s that much more important that the indoor air quality in your home is at its best. Scheduling an air duct cleaning service from J&M Services ensures that your family game night will be a breath of fresh air. 4. Mold and bacteria build up fast. While cleaning routines sometimes take a break over the summer, mold and bacteria don’t. This break in the typical cleaning routine may allow mold and bacteria levels to rise over the summer. As we start turning up the thermostat and get the heating system going again any of that potential built up mold or bacteria is prime to be spread throughout your home. A simple air duct cleaning service ensures that bacteria and mold spores are removed along with any dust particles, making your home a much healthier place for your family. 5. Starting the school year with clean air starts it off right. Clean air ducts make your home a healthier and happier place to live. 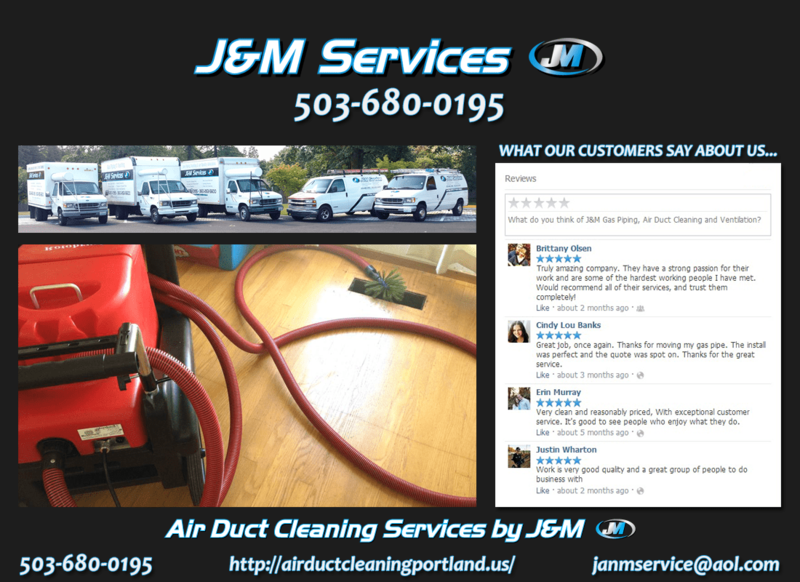 Contact J&M Services today to schedule your air duct cleaning service and be ready when school starts and the fall weather arrives.